Used Alfa Romeo 156 Review - 1997-2006 Servicing, MPG, Insurance | What Car? 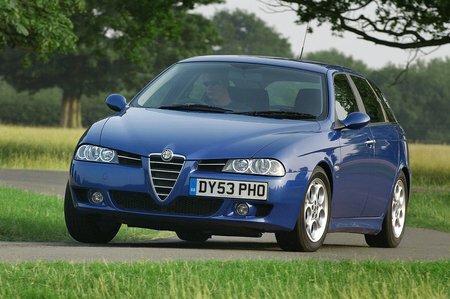 What used Alfa Romeo 156 estate will I get for my budget? How much does it cost to run a Alfa Romeo 156 estate? Pick one of the smaller petrol engines or the diesel and bills shouldn't be too big; the 1.6 and 1.8 petrols return a reasonable 43.5mpg, while the 2.4 diesel should average 51mpg. The 2.0 petrol is not much thirstier than the 1.8, but its sportier nature attracts a higher insurance rating. Meanwhile, the 2.5 V6 and GTA model require deep pockets. Repair costs will be higher than for many mainstream brands, too, while problems with the Selespeed semi-automatic gearbox can be particularly troublesome to fix. Still, the 156 doesn't hold on to its value especially well, which is good news for used car buyers.